A nationally lauded marketing and communications professional, Evan has played a dynamic and influential role in Queensland’s multicultural and arts industries for 2 decades. One of Australia’s most experienced marketers in the multicultural and NFP sector, he is a respected leader of creative teams, multimedia divisions and corporate communication departments. He is renowned for his ability to build the infrastructure to help CEOs, board members and senior management of corporates, not-for-profits, local, state and federal government and community organisations achieve cut-through for social impact. 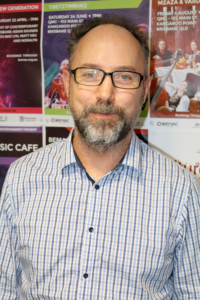 Involved in creative and cultural sector development for almost 30 years, Ant Mckenna has worked for Arts Queensland and led arts, cultural and creative development on the Sunshine Coast as Team Leader of Cultural Programs for Sunshine Coast Council. His work saw the development of the Horizon Festival, a major increase in RADF funding, doubling of participation to the Sunshine Coast Art Prize, amongst other achievements. Ant was involved in the early development of Q Music, managing the ground-breaking state-wide A-Venue music industry development program and leading the organisation for the initial BIGSOUND artist showcase in 2005. Simon joined BEMAC in 2017. 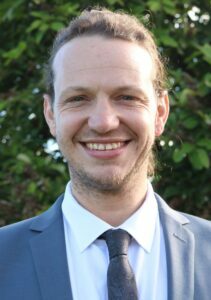 An experienced creative and cultural producer, event manager, arts facilitator and educator, production manager and music producer, Simon is passionate about developing and building culturally diverse artists and communities through multi-arts processes of creativity and culture. He is the creative force behind World of Dance, Creative Schools Initiative and District Studios, a creative visionary who works with a passion to bring together culturally diverse artists, arts workers and producers to implement great ideas through creativity and culture. As BEMAC’s Artist Development Coordinator, Simon is dedicated to developing and amplifying the multicultural talent Brisbane is home to. Christina joined BEMAC in 2012 specialising in operational business management, human resource management and commercial finance. Christina is a practical and logical thinker with natural attention to detail that allows her to effectively manage multiple departments within the organisation’s overall corporate model, including HR, production, co-ordination and logistics. 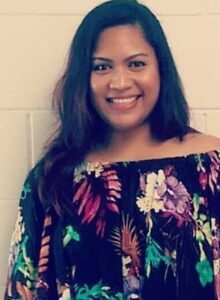 With a side passion in festival and event management she has worked on a number of significant multicultural events including World Refugee Day and Asia Pacific Cities Summit. Her broad multicultural, music and finance background brings a depth to her ability to oversee the business operations at BEMAC. Christine is an award-winning journalist who made the move from the media to the arts in 2016 when she joined the team at BEMAC. Growing up in South Africa as the country transitioned from a separatist society into one that embraced its multiculturalism, and witnessing the fundamental role artists and the arts had played in not only dissipating the Apartheid Regime, but healing the wounds of her homeland and shaping its new identity, Christine has a strong conviction in the power of artistic expression. 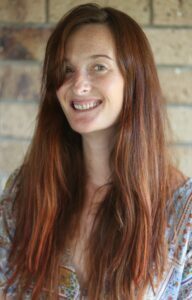 With exceptional writing skills, a healthy appetite for music and the arts and a deep passion for multiculturalism, Christine brings an authentic and passionate voice to BEMAC’s marketing and communications. Nihad’s career with BEMAC has spanned an incredible 20 years. Three years after arriving in Brisbane as a Bosnian refugee, Nihad decided to shed his mechanic career and apply for the position of caretaker at the heritage-listed Yugumba building, which was BEMAC’s home for almost 20 years. With exceptional problem solving skills, an eye for detail and strong technical abilities, Nihad makes sure the Queensland Multicultural Centre is always in tip-top condition. From fire safety to routine maintenance, Nihad is our man. BEMAC doesn’t merely provide a platform where Nihad can apply his broad skills set, the opportunity to work with people from diverse backgrounds gives deep satisfaction to this accidental cultural scholar. A skilled and experienced events coordinator, Lily is also the founder and executive director of My Story , an arts organisation that aims to inspire and promote positive change through productions and programs based on stories of faith, hope, and love. upon release. She is also a member of Verandah ChiX, a Brisbane-based female vocal ensemble, whose origins come from the Torres Strait Islands, Aboriginal Australia, South Sea Islands, Papua New Guinea, France/Israel, South Africa, and Polynesian Islands. A passionate, young and ambitious artist, Jennifer has joined BEMAC in 2018. She has thrived in the world of dance and physical theatre since 2013, working with a number of Brisbane and international companies in her time performing. With over four years working as a local dance teacher, Jennifer is driven to ignite the passion in young artists and multicultural community groups. Jennifer believes in the opportunity for each individual, and is driven to create pathways for as many diverse groups through her work at BEMAC. After completing her Bachelor of Creative Industries (Dance major, Entertainment/ Entrepreneurship minors) in 2018, Jennifer is equipped with skills in project management, marketing, advertising and organisation. She has a great knowledge of Queensland arts sectors and networks, and most importantly, is driven in applying her own creativity and passion into all aspects of her work.